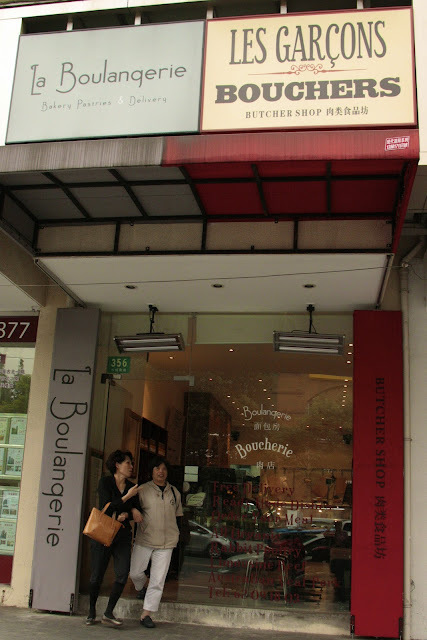 I'm a little slow on the uptake, but I have only just discovered there is a genuine French butcher here in Shanghai. There are plenty of 'genuine French' things in Shanghai, but on closer inspection they are often not. A boulangerie selling pork floss buns? Loius Vitton (sic) bags and wallets? A French Cafe completely untouched by coffee beans? A bottle of Chateau Laffitte (with 2 fs and 2ts, to avoid copyright issues)? There is no end to Chinese ingenuity when it comes to reproducing something that might be profitable - so faking French beef or lamb shouldn't be so hard. Should it? So I admit I was a touch sceptical about Les Garcons Boucherie, with attached Boulangerie. It's out in west Shanghai, in the expat belt of Gubei, in a non-descript strip of shops on Shuicheng Lu. In fact it's just on the other side of the elevated highway to Carrefour. But this is the real deal, with a genuinely real butcher with an eye for lovely meats, juxtaposed with a real French bakery run by a real French baker. David Emer (the butcher) and Laurent Meffre (the baker) set up shop 6 months ago, and will shortly be moving to separate larger premises, with Les Garcons Boucher moving to Jianhe Lu slated for November. The selection of meat and charcuterie is small but perfectly formed, although surprisingly little is from France. 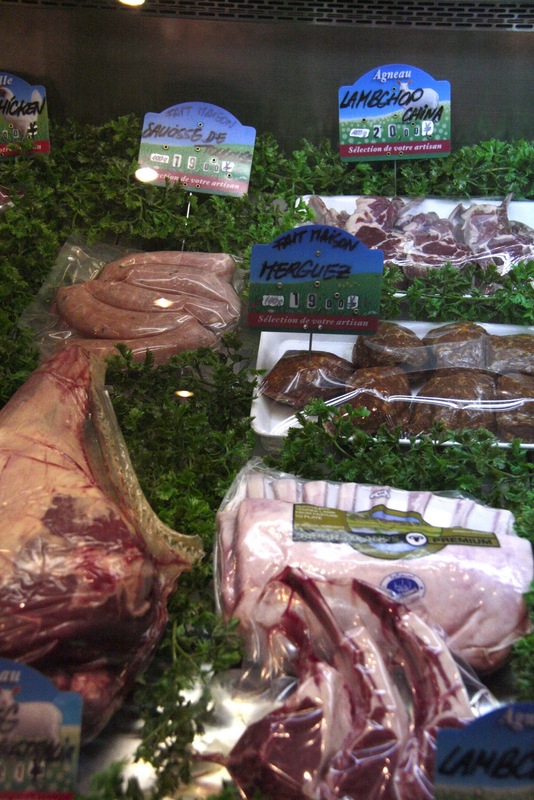 Instead they have sourced the best cuts of meat from the best local and international suppliers. Think of all those saved food miles! So the entrecote de boeuf and beef shin is from China, the lamb is both local (cutlets) and imported (legs). They make their own small range of plump sausages and their own terrines and pate. Fresh chevre too! It all looks good, and when I've cooked the 3.5kg leg of Australian lamb I'll let you know how it tastes.